Discussion in 'Science and Pseudoscience' started by Andy Eyre, Jun 24, 2014. Deta Elis are a Russian company which provide well being devices based on the work by Paul Schmidt and Royal Raymond Rife. They have clinical studies and patents. Does anyone know of a low price resonance frequency analyser which could read the frequencies emitted and possibly debunk these devices? A blog-post on the tech. Not a sceptical one. The first stop in this revolution is Hepatitis B and C as well as herpes. Russian doctors are claiming a ninety percent cure rate for these incurable infections. Looks like a woo wrapped up in a pyramid scheme. The FAQs on the website detail a reward system for soliciting sales, but you need to register (€40) and then purchase a device (€500) within 15 days. Buyers then have to register (€40) for you to qualify for commission on the sale. No refunds, no returns. I imagine Dr Sircus is trying to get his €540 euros back. A physical test isn't really necessary for it to be proven as psuedo-science; the explanation for how bioresonance is supposed to work doesn't add up and the claim has been around for a while. But if someone had money to spare, a detailed physical investigation would be useful. But 'low-cost' for an analyser seems to be about 500 euros. You can't even download the manual unless you've already bought a device. The problem with investigating things like this is that without already knowing what the device is supposed to do, there really is no low cost alternative, you have to play their game to get it. I found some bioresonance devices on ebay ranging from $60 to $9,000, but they're clearly not all for the same thing. Some are ultrasound devices (one is an actual medical ultrasound, others appear to be ones but without the monitor), some are magnet therapy, one (for treating hypertension) is just a whole lot of needles. One of them (for "bioresonance tachyon quantum therapy") is a black box with dials and an orgonite pendulum on a wire. Another is just the orgonite pendulum. One is an orgonite pyramid with "homeopathic imprinters" on it. A few more are just various quartz crystals with wires through them. One claims to "open your heart chakra." Heck, one of them is just a new age music CD that's supposed to heal muscle injuries. This is the problem with quackery: When the words don't actually mean anything anyway, you can attach it to anything. So if you want to test these guy's device, you need to buy it from them - there's no telling which if any of the ones on ebay match its function. Edit: Oh god I just realized I was logged into eBay and now that stuff is going to be cluttering my suggestions for months. I am wanting to buy a device and test the frequencies coming out. The technology is rife in Germany (forgive my pun) particularly with companies Rayonex and Bicom. The topic is not focussing on Rife the fraud, the technology obviously works, there are modern examples all over the world, price ranging from hundreds to thousands. I can give links if you wish. You either believe the technology or you don't. I believe that resonance can manipulate cells, molecules, atoms, etc. Everything I'm the world vibrates, and frequency is the information carrier. Do you know which instrument could read the frequencies emitted by the Deta Elis devices? Thanks Pete, spectrum analyser looks good! but this is not evidence that it works. 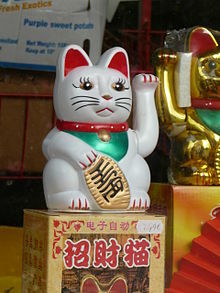 I could spend £1 or near £600 on a Maneki-Neko, but neither will make me rich. The topic is not focussing on Rife the fraud, the technology obviously works, there are modern examples all over the world, price ranging from hundreds to thousands. I can give links if you wish. Yeah, I don't think you're going to go unchallenged on this assertion here, as it doesn't appear so 'obvious'. Are the links to modern examples all over the world of the devices efficacy, or just to people selling them? Does this companies' bioresonance tech differ in any significant way from the other bioresonance devices around the world? Do you suspect they may be more or less effective? Do you have examples of one proven to be effective at destroying diseases in people? The claim is that use of these devices is widespread all over hospitals in Russia, so there must be a lot of data on their results by now surely. You either believe the technology or you don't. Well, you make it sound like the decision is completely arbitrary. Scientific evidence that it works would a good reason to believe. Lack of it would be a good reason not to. What would it matter? What frequencies do you think would be effective, and why do you think so? Is there any evidence supporting the claims? Psycho-immunology: Illness and stressed conditions where the primary cause lies in some past emotional, mental or physical trauma that the person has never got over fully. Any claim that something cures everything will meet with skepticism here. This sounds a lot like georesonance which was debunked here some time ago. Go to the thread "Debunked: Exploration company "Georesonance" believes it may have found MH370". This approach claims to find any material or element under water or earth using "resonance frequencies". Seems like all of these types of claims come out of Russia or the Ukraine. The statement that "the validity of this holistic therapy method is now beyond doubt, since it has been proven empirically by many researchers around the world" needs supporting evidence. They have a series of certificates, awards and clinical studies conducted. Do you mind sharing the studies with us? , since it has been proven empirically by many researchers around the world. Any verification of the empirical proof from independent sources? inflammation of the adrenal, the bladder and kidneys. sand and stones in the kidneys, bladder. Is there any evidence for the effectiveness of the DeVita devices? Having seen many cells/parasites through microscopes myself, its apparent that these clips are sped up (the first makes no mention of this, but the second does). However, there is nothing "special" about these clips. It looks like normal cell bursting (called lysis), probably from osmotic imbalance. It's a shame deta-elis havnt listed what exact protozoa we are watching be destroyed, but I will ask one of my colleagues to help identify some possible candidates. *Probably paramecium caudatum? Assuming the organisms presented in deta-elis' videos are paramecium species, then there are not really "parasites" (to humans at least) and are not likely to cause disease or illness to us, which makes it an unusual organism to demonstrate the usefulness of their devices. the first video ( b&w) is from a documentary on Rife's life. *im bypassing the no-click policy because i cant tell what's relevant here, if anything. SWR used a frequency generating device to apply square waves in vitro to parameciums. Whereas frequency 1150 Hz was able to completely debilitate/destroy the parameciums, a smaller microbe was not so affected, as you will see in the video. I'm sorry, no disrespect, but I just don't think that this statement works on any level. how can any company be "...a reliable bioresonance company"? What are those "certificates" (in Russian) supposed to mean? What distinguished scientific body is cranking out so many "certificates" and to what end? even if accepted by many Russians. with the company offering repeated assurances that, no, their devices will not harm you. This suggests that they don't believe their expensive boxes will do anything...positive or negative. "Just like with the proper resonance a glass can break into a thousand pieces, the same can happen with the emission of electromagnetic waves in the appropriate frequency to a virus, a bacterium, a microorganism or a parasite." - Albert Abrams used various machines which used frequencies to cure any disease in the early 1900's. He claimed "...it could diagnose any known disease from a single drop of blood or alternatively the subject's handwriting" He died of pneumonia aged 62, presumably forgetting to check his own. - Royal Rife was blessed with one of the most epic names ever. He claimed to have invented a light microscope with a magnification of 50,000X (an impossibility, but wont discuss here as its OT). He build on the ideas of Abrams to design his own frequency device to vibrate pathogens to death. These were are often refereed to as Rife Devices. Much like Abrams, he was widly discredited during and after his lifetime. -Deta Elis is using the same ideas is Abrams/Rife, just repackaged for a new century. Deta Elis seems to be a reliable bioresonance company. It appears not. Their videos on their youtube channel are not thier own, but rather lifted from a documentary on Rife, or from Squarewave Research. Considering how easy it is to film via a microscope these days, and how apparently successful these devices are, surely they can produce some original material to back up their claims, particularly that it can vibrate pathogens to death, instead of showing other peoples clips of non-pathogenic protozoa experiencing events which look visually similar to osmotic imbalance. Awards and certificates that you award yourself don't count in the real world. Similarly studies that you conduct yourself and are not (or cannot) be independently verified don't count. Technically, no. Abrams claimed his device would work via phonelines, but what does it matter if the device is a sham? As regards bioresonance itself, the validity of this holistic therapy method is now beyond doubt, since it has been proven empirically by many researchers around the world. The content in the web pages or sites linked to this Statement are intended only for jurisdictions where providing such information is lawful. It is up to the user to determine that for himself. Neither Squarewave Research nor any of its officers, affiliates, or agents shall be liable for any direct, incidental, consequential, indirect or punitive damages arising out of access to or use of any content of this site or the content of any site or sites linked to this site. We have to start at the beginning. Do we on don't we accept the scientific fact that all 'matter' is nothing but condensed energy waves? I hope we do. Pity that the human eye can 'see' only about 0,1% of the spectrum. These energy waves are vibrating at a certain frequency. A stone is vibrating, a tree, a quartz crystal is vibrating, the human cells vibrate, the parasites vibrate, we live in a universe of vibration. This is not any pseudo-science, it is a scientific fact proven in laboratories. Every cell and thus every organ in our body emits its own distinctive frequency when healthy. If the frequency deviates upwards there is inflammation of the organ, if downwards there is deterioration of the functions of the organ. What bioresonance researchers did, was to identify the frequency emitted by every parasite that can reside in the human body (we are talking about 0,01 Hz accuracy). They found that when you direct the same frequency on the parasite (virus or any other) itself, its cellular membrane brakes, by resonance. You can find many videos in youtube on braking glass with resonant frequency, to understand how this works. Moreover they identified the healthy frequencies of our organs and can diagnose when an organ is dysfunctioning. The actual frequencies are what is most important and not the device itself. Building a device that emits low frequencies is easy. Finding the correct frequencies took years of research. As regards the fact that the company chose to sell their products through networking and not through retail stores, I find it a good choice, since your satisfied customers are the best salespersons for your product. I can tell you that the device(s) have worked just fine for me. I have solved my constipation problem and forgot my lumbar spine pains. I met with holistic doctors that have cured more serious problems using the devices, but I can only state my own experience. I present three photos, two from the manual of my device and one of the back of the device itself. As you can see, the fact that the devices can emit the claimed frequencies is guaranteed by the German factory. You can trust it or not. I was impressed to see that every device has its passbook, signed by the control technician that has checked it. Without reading what frequencies may have caused the paramecium cell membrane to lyse, the word sonication comes to mind. I have used sonication in labs to lyse cell membranes to release cellular organelles. I have also used this technique to create tiny incisions in plant materials for genetic transformation. I do not understand how such a frequency could be selectively destructive. Are there any studies blasting "bad" cells vs "good" cells with the same frequencies? Those pages just look like the operation/specification booklet you get with anything from a toaster to an e-cig. Most of your opening paragraph sounds extremely dubious to me, but let's ignore that and look at the practicalities. How do you know your particular device remains in calibration? 0.01Hz accuracy sounds like a great bit of blurb, but pretty much every device that depends on accuracy needs to be regularly recalibrated. How do you know your device isn't 0.5Hz off track, and that 0.5Hz is the difference between wiping out blastocystis and destroying your liver? Electronic transmitters do not need recalibration. Recalibration is 30 years ago technology. You cannot resonate anything else except the object that can resonate with the specified frequency. They found that when you direct the same frequency on the parasite (virus or any other) itself, its cellular membrane brakes, by resonance. You can find many videos in youtube on braking glass with resonant frequency, to understand how this works. A cell is not like glass or quartz. Glass and quartz are relatively homogeneous structures with molecules that all respond to external vibrations the same way. Cells are made up of a huge number of vastly diverse molecules that all have different properties. I would imagine that the number received from measuring the frequency of a cell would just be the noise of many molecules jittering and vibrating at different frequencies. So a basic question here is how exactly do people measure the frequency of a cell? The second and very important question is, where is the data showing that these devices can specifically target pathogens while leaving host cells alone? What if frequencies overlap? The concept does not make sense in theory, so you must provide evidence if you're going to claim the technology can do this. The page you referenced offers no data or articles and instead just claims it can treat pretty much any disease. That is not something to be taken lightly. If you're going to claim that a product can treat serious illness you better damn well provide evidence, not just some hand waving about frequencies. Yes that's basically what I want to know as well. Is there a chart that classifies a pathogenic cell versus a host cell? How can this device differentiate between the normal microbial flora (or is it fauna?) vs a pathogenic microbe? All I can think of is that this device may cause a little more vibration amongst molecules, but nothing destructive. If destructive (like UV) it would break bonds amongst other molecules; therefore not selective. Perhaps in Russia? The rest of the world recognises the importance of calibration/recalibration, which is why they're included in international quality standards. Take beam radiotherapy equipment as an example that would seem parallel to this device, at least in purpose - that needs to be regularly calibrated. So here we have a hand-held consumer device, which (if the claims are to be belived) is as capable of destroying healthy cells as parasitic ones, depending on the frequency used, and the targetting of different cell types requires accuracy to 0.01Hz. On top of that, it's so well designed that after a week, month, year or decade of use/abuse, the user can be confident that by just flicking the dial to "parasite", it'll emit only the correct frequency to destroy those cells, and not the tissue of some vital organ that they might actually need. They can be sure of this, not because it's regularly calibrated to ensure it only emits the correct frequency, but because its got a CE mark and Helmut in Dortmund signed the instruction manual. If it worked, which given the lack of evidence seems doubtful, it looks like it would be extremely dangerous. Can't say for sure, but since the collapse of Soviet Union, pseudoscience in Russia appears to be on the rise. In the past, no serious soviet scientist would use the world 'bio-field' in a different context than a 'potato or other root vegetable field' they were sent to harvest every autumn. Also, this thread reminded me about a common physiotherapy treatment there at the time of my childhood (1960s/70s), called УВЧ-терапия (high-frequency electromagnetic field therapy). It had nothing to do with a bio-resonance, however. "Uh, yep, Deta Elis confirms that what Deta Elis says is true. Really." Sorry, this just doesn't qualify as real proof. why should anyone feel obligated to take their wild claims seriously? Great questions risen in this thread about bioresonance devices. I hope they get answered. For me, I believe my own research and the empirical results on my own body. At least, I spent the money to try for myself and reach conclusions. As far as I am concerned, bioresonance therapy worked for me, and the devices of Deta Elis are effective. ...For me, I believe my own research and the empirical results on my own body. At least, I spent the money to try for myself and reach conclusions. But of course you did not come here to talk only to yourself. In biblical words "Your Faith Has Healed You". Told differently, it was most likely either a placebo effect or a coincidence. This is exactly why clinical trials are made as blind tests, double-blind tests, or triple-blind tests. And not by the inventor, but rather by an independent laboratory (or more of them). It helps excluding the the bias and the placebo effect. And the bigger sample, the better, of course. A single case tells nothing. ...bioresonance therapy worked for me, and the devices of Deta Elis are effective. In biblical words "Your Faith Has Healed You". Told differently, it was most likely either a placebo effect or a coincidence. his posts sometimes look like an advert: "The devices of Deta Elis are effective." Yes, the original post did not exclude another possibility. And that's exactly why pharmaceutic and medical firms have to clinically test their products by independent third parties, using double-blind and triple-blind trials. I assume Deta Elis had to perform such testing too, and the respective protocols should be available. All we need is a link pointing to the results, so that we can scrutinize them. Without any clinical test protocol, there is no reason for considering it functional. If the frequency deviates upwards there is inflammation of the organ, if downwards there is deterioration of the functions of the organ. Surely an inflammation of an organ (a supposed frequency increase) would severely deteriorate the functions of the organ (a supposed frequency decreade)? For example, Hepatitis causes inflammation of the liver. Hepatitis can also deteriorate function of the liver (jaundice, cirrhosis, liver failure, etc). and, personally, even IF they showed me through a microscope what frequency blew-up what parasite, (which i havent seen anywhere), i would still want through-the-microscope proof that each of these thousands of frequencies i might choose, arent blowing-up my good bacterias and cells!! On an upnote, i'm starting to see why maybe the haarp people are freaking out. I hope you understand the potential harm in telling others that these devices work. If there is no data you can point us to as to how or whether or not these devices work then it is unethical to recommend it to sick patients. Sometimes people who are in despair will opt for things like this and forego conventional treatment that could actually save their lives, replacing it with unproven methods. It goes against the hard work that so many researchers have put into developing and understanding medicine. If you find answers to any of the questions we asked you here, please come back and post.